Raumfahrt+Astronomie-Blog von CENAP - Blog: Raumfahrt - This massive rocket creates a fireball as it launches, and that’s by design No, the rocket isnt about to blow up—its just physics in action. Anyone who watched the launch of United Launch Alliance's Delta IV Heavy rocket on Saturday was treated to an up-close view of the liftoff. This vantage point, showing the three-core rocket taking off beneath blue skies, offered a distinct view of a fireball engulfing the rocket during launch. This can be rather distracting if you've never seen it before—uhh, is that rocket about to blow up?—but in reality it's a byproduct of the RS-68 rocket engines that power each of the three cores of the Delta IV Heavy launch vehicle. Developed during the 1990s by Rocketdyne, the expendable RS-68 engine was designed to be less expensive and more powerful than the Space Shuttle's reusable RS-25 main engines. Like the Shuttle's engines, the RS-68 engine runs on a cryogenic fuel mix of liquid hydrogen and liquid oxygen. The fireball phenomenon manifests on the Delta IV Heavy rocket because of design differences between the RS-68 and the Shuttle main engines and because the RS-68 fuel valve is open longer before the oxidizer starts flowing. Essentially, at engine startup, only liquid hydrogen is running through the engine because it is less chemically active than oxygen. This hydrogen flows out of the engine, and because hydrogen is very light compared to ambient air, it rises up the outside of the rocket. When the liquid oxygen flow begins, the hydrogen is ignited into a fireball. This occurs within the last five seconds of the countdown, creating the arresting images of a fireball charring the orange foam exterior of the Delta IV Heavy rocket. As for Saturday's launch, it went off well, with the Delta IV Heavy rocket boosting the classified NROL-71 payload into orbit for the National Reconnaissance Office. 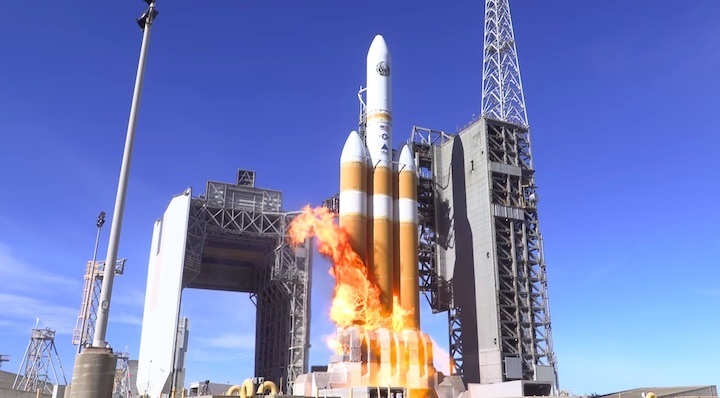 The company's next launch is the WGS-10 mission, which will fly a geostationary communications satellite for the US Air Force on a Delta IV rocket. Presently, the launch is scheduled for March 13 from Cape Canaveral Air Force Station, Florida. Raumfahrt - This massive rocket creates a fireball as it launches, and that’s by design No, the rocket isn't about to blow up—it's just physics in action.